You’re on Vince Lombardi quotes, page 7 of 11 of Football Sayings — see menu at bottom of page for other pigskin offerings. The Brooklyn-born Vince Lombardi never had a losing season as a coach. Widely regarded as the best NFL coach of all-time, he also had a way with words. See some of the coach’s quotations on a wide variety topics below. 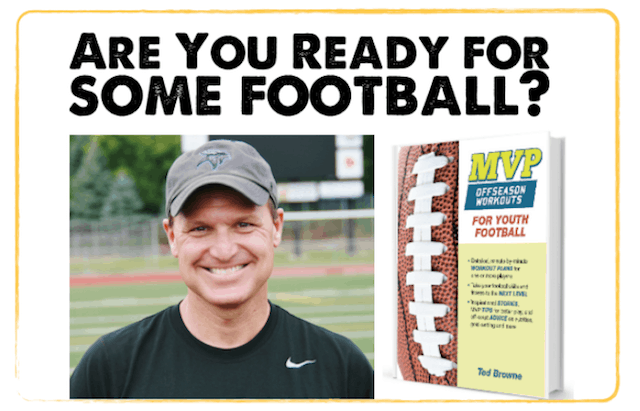 Behind talented stars like Bart Starr, Willie Davis, Paul Hornung and Ray Nitschke, this pigskin coach led perhaps the greatest NFL team of all time: The early 1960’s Green Bay Packers. The small metropolis of Green Bay, Wisconsin, with the smallest population of any NFL city became known as Titletown. He was all about leadership, service and commitment group work principles. 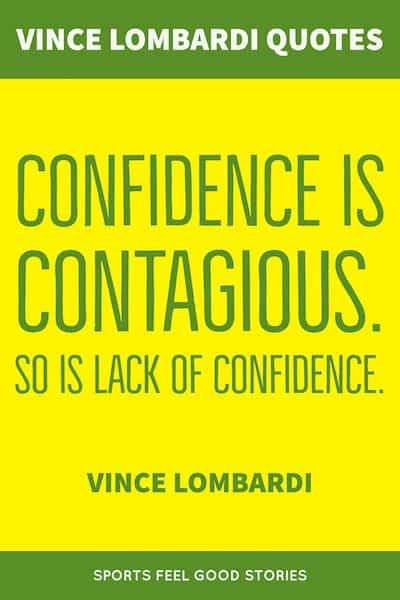 Enjoy these Vince Lombardi quotes. You never win a game unless you beat the guy in front of you. The score on the board doesn’t mean a thing. That’s for the fans. You’ve got to win the war with the man in front of you. You’ve got to get your man. It is essential to understand that battles are primarily won in the hearts of men. Men respond to leadership in a most remarkable way and once you have won his heart, he will follow you anywhere. Leadership is based on a spiritual quality — the power to inspire, the power to inspire others to follow. Having the capacity to lead is not enough. The leader must be willing to use it. Leadership rests not only upon ability, not only upon capacity – having the capacity to lead is not enough. The leader must be willing to use it. His leadership is then based on truth and character. There must be truth in the purpose and will power in the character. A leader must identify himself with the group, must back up the group, even at the risk of displeasing superiors. He must believe that the group wants from him a sense of approval. If this feeling prevails, production, discipline, morale will be high, and in return, you can demand the cooperation to promote the goals of the community. Leadership is not just one quality, but rather a blend of many qualities; and while no one individual possesses all of the needed talents that go into leadership, each man can develop a combination to make him a leader. The spirit, the will to win and the will to excel – these are the things that endure and these are the qualities that are so much more important than any of the events that occasion them. There’s only one way to succeed in anything, and that is to give it everything. I do, and I demand that my players do. Success is based upon a spiritual quality, a power to inspire others. Winning is not a sometime thing – it’s an all the time thing. You don’t win once in a while – you don’t do the right thing once in a while, you do them right all the time. Winning is not everything – but making the effort to win is. 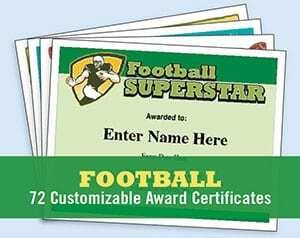 Running a football team is no different than running any other kind of organization. Some of us will do our jobs well and some will not, but we will all be judged on one thing: the result. The objective is to win: fairly, squarely, decently, win by the rules, but still win. A team that thinks it’s going to lose is going to lose. Second place is meaningless. You can’t always be first, but you have to believe that you should have been – that you were never beaten – that time just ran out on you. They call it coaching but it is teaching. You do not just tell them…you show them the reasons. I firmly believe that any man’s finest hours – his greatest fulfillment of all that he holds dear – is that moment when he has worked his heart out in good cause and lies exhausted on the field of battle – victorious. 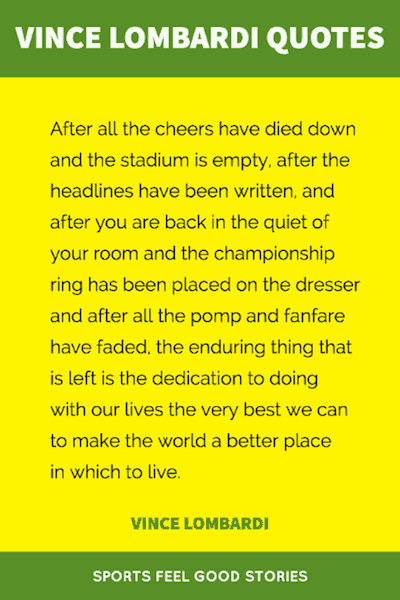 After all the cheers have died down and the stadium is empty, after the headlines have been written, and after you are back in the quiet of your room and the championship ring has been placed on the dresser and after all the pomp and fanfare have faded, the enduring thing that is left is the dedication to doing with our lives the very best we can to make the world a better place in which to live. The spirit, the will to win and the will to excel — these are the things what will endure and these are the qualities that are so much more important than any of the events themselves. Individual commitment to a group effort – that is what makes a teamwork, a company work, a society work, a civilization work. 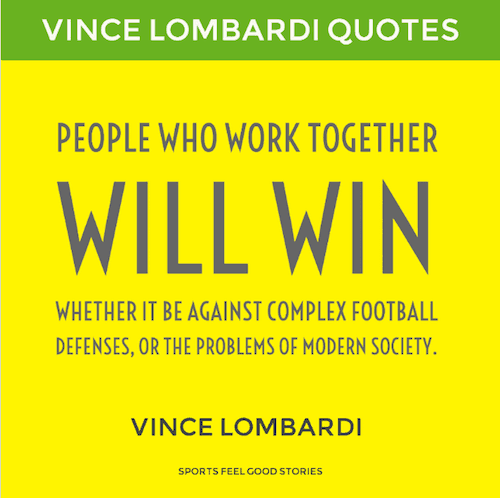 People who work together will win, whether it be against complex football defenses, or the problems of modern society. Individual commitment to a group effort – that is what makes a team work, a company work, a society work, a civilization work. 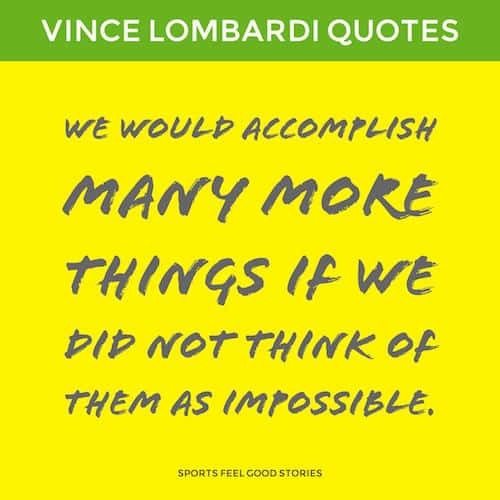 Note: These Vince Lombardi sayings on commitment team work can not only be used in football settings, but also in other sports settings, business, organizations, and more. Once a man has made a commitment to a way of life, he puts the greatest strength in the world behind him. It’s something we call heart power. Once a man has made this commitment, nothing will stop him short of success. Winning is not a sometime thing, it is an all the time thing. You don’t do things right once in a while – you do them right all the time. Unless a man believes in himself and makes a total commitment to his career and puts everything he has into it – his mind, his body, his heart – what’s life worth to him? I would say that the quality of each man’s life is the full measure of that man’s commitment of excellence and victory – whether it be football, whether it be business, whether it be politics or government or what have you. To achieve success, whatever the job we have, we must pay a price. Success is like anything worthwhile. It has a price. You have to pay the price to win and you have to pay the price to get to the point where success is possible. Most important, you must pay the price to stay there. 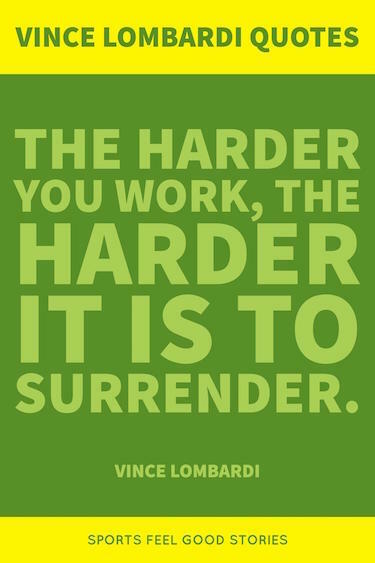 Tip: Some of these Vince Lombardi quotations make great photo captions on Instagram and Facebook. Once you agree upon the price you and your family must pay for success, it enables you to ignore the minor hurts, the opponent’s pressure, and the temporary failures. In order to succeed, this group will need a singleness of purpose, they will need a dedication, and they will have to convince all of their prospects of the willingness to sacrifice. Most important of all, to be successful in life demands that a man make a personal commitment to excellence and to victory, even though the ultimate victory can never be completely won. Yet that victory might be pursued and wooed with every fiber of our body, with every bit of our might and all our effort. And each week, there is a new encounter; each day, there is a new challenge. The good Lord gave you a body that can stand most anything. It’s your mind you have to convince. I’ve never known a man worth his salt who, in the long run, deep down in his heart, didn’t appreciate the grind, the discipline. Mental toughness is many things and rather difficult to explain. Its qualities are sacrifice and self-denial. Also, most importantly, it is combined with a perfectly disciplined will that refuses to give in. It’s a state of mind – you could call it character in action. Obstacles are what you see when you take your eyes off of the goal. There is only one kind of discipline, and that is the perfect discipline. As a leader, you must enforce and maintain that discipline; otherwise, you will fail at your job. Once you have established the goals you want and the price you’re willing to pay, you can ignore the minor hurts, the opponent’s pressure and the temporary failures. If you’re lucky enough to find a guy with a lot of head and a lot of heart, he’s never going to come off the field second. Brains without competitive hearts are rudder-less. Mental toughness is Spartanism, with all its qualities of self-denial, sacrifice, dedication, fearlessness, and love. Watch your actions, they become your habits. Watch your habits, they become your character. If you don’t think you’re a winner, you don’t belong here. Don’t succumb to excuses. Go back to the job of making the corrections and forming the habits that will make your goal possible. When we place our dependence in God, we are unencumbered, and we have no worry. In fact, we may even be reckless, insofar as our part in the production is concerned. This confidence, this sureness of action, is both contagious and an aid to the perfect action. The rest is in the hands of God – and this is the same God, gentlemen, who has won all His battles up to now. I derived my strength from daily mass and communion. There are three things that are important to every man in this locker room: His God, his family, and the Green Bay Packers — In that order. It is and has always been an American zeal to be first in everything we do, and to win. If you aren’t fired with enthusiasm, you’ll be fired with enthusiasm. To be successful, a man must exert an effective influence upon his brothers and upon his associates, and the degree in which he accomplishes this depends on the personality of the man. The object is to win fairly, by the rules – but to win. Morally, the life of the organization must be of exemplary nature. This is one phase where the organization must not have criticism. Faithfulness and truth are the most sacred excellences and endowments of the human mind. Tip: If you’re trying to inspire a team, use some of these select football quotes in your communications – be it live or in writing. Before I can embrace freedom, I should be aware of what duties I have. I’ve been in football all my life, gentlemen, and I don’t know whether I’m particularly qualified to be a part of anything else, except I consider it a great game, a game of many assets, by the way, and I think a symbol of what this country’s best attributes are: courage and stamina and a coordinated efficiency or teamwork. Listen to some of Vince Lombardi quotations live on packers.com where Vince is mic’ed up. If you have any suggestions for our Vince Lombardi lines, please let us know via the Contact page. As the coach might say, it’s all about team work. Thanks. You’re on page 7 of 11 of Football Quotations.